For optimum efficiency, WCS recommend that routine maintenance should be performed on reverse osmosis systems. Generally, RO systems have three, four or five-filter stages. Without detailing each stage of the RO process (since the number of stages varies based on the model), here is some basic maintenance information that applies to most RO units. First: In order to protect the delicate RO membranes, water first flows through a pre-filter. This pre-filter cartridge is designed to filter out dirt, silt, sand and other sediments. This pre-filter should be changed every 6-9 months. If not properly maintained or changed on schedule, the pre-filter can foul or become clogged, thereby making it unable to protect the RO membranes. Second: The next phase is generally a carbon filter which is designed to remove chlorine and other taste or odor contaminants. This is important because chlorine can ruin the RO membrane. This carbon filter should be replaced every 6-9 months, also. Third: This is the actual reverse osmosis phase. Reverse osmosis (RO) is a separation process that uses pressure to force water through a membrane. The membrane retains the contaminant on one side and allows the pure solvent (water) to pass through to the other side. This process is the reverse of the normal ‘osmosis process’, which is the natural movement of solvent from an area of low solute concentration, through a membrane, to an area of high solute concentration when no external pressure is applied. Water passes through the RO membrane at generally 35 pounds per square inch (psi). At this rate, roughly two drops per second. The contaminants rejected by the membrane are piped down the drain. RO membranes should be replaced every 2-3 years. 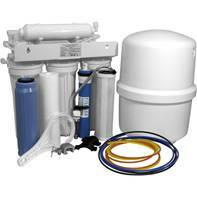 NOTE that filter and membrane lifespan will vary based upon local water conditions and usage. Fourth: Finally, a carbon filter stage is usually added to “polish” off the water at the end of the cycle. This stage removes any remaining taste or odors to create outstanding drinking water. The carbon filter should be changed every 6-9 months. If you don’t change the filter, over time the system will begin to produce less and less water, ultimately not producing water at all. Decrease in water production is a strong indicator that you have reached the end of the filter and membrane useful life. Thus, it’s always a good idea to set a reminder and change the filters and membranes on schedule. A system disinfection and recharge should be completed annually. If a reverse osmosis system is serviced and maintained as parts wear out, the system can last for years, 10 to 15 years is very possible! Make sure to follow the membrane filter schedule and sterilize/clean the system annually. A softener and an R.O. system are a great combination. The softener will soften the water throughout the site, AND the RO system will remove 98% of all sodium in the water. This duo makes for great-tasting drinking water. Because calcium and magnesium, the minerals that make water hard, are difficult minerals for an R.O. membrane to remove, the softener acts as a protective barrier for the RO system. This protection keeps the RO system from fouling and can extend the life of the membrane.